I absolutely cannot take credit for this design, as a member of the Yahoo! Backyard Rink group described it in an e-mail back in December of 2009. When I e-mailed him and asked for his permission to include it here, the e-mail bounced. So Rob (rbrand1124), if you’re out there, the backyard rink community thanks you! 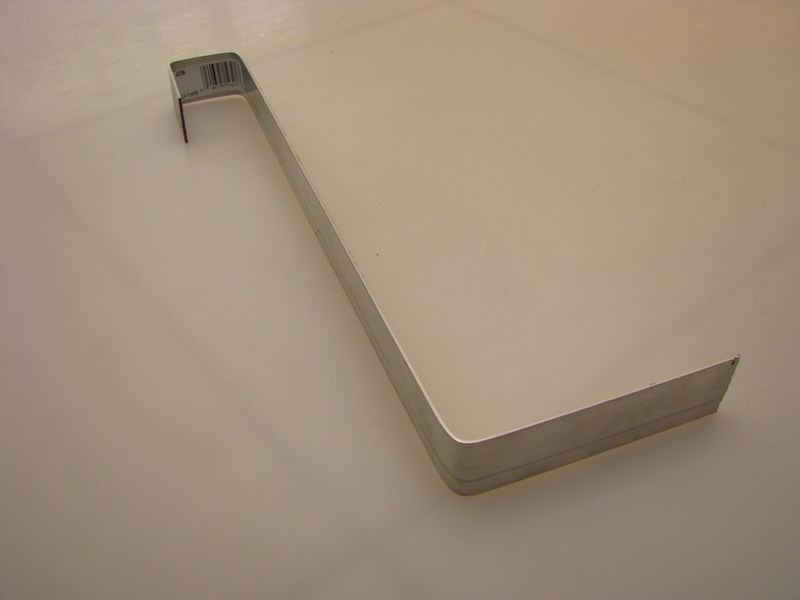 The necessity of an ice thickness ruler may not be obvious at first. In fact, I’ve spent the last two years building a backyard rink without the ability to see how thick my ice was. For the most part, that inability was a non-issue. But one day in the middle of last season changed my mind. It was January 3rd, and we were digging out from a three-day storm that saw nearly a foot of light, fluffy snow cover our rink. We had filled two weeks prior, so I assumed my rink was frozen to the ground, and that my liner was holding a solid brick of backyard ice. I was wrong — instead of a solid slab, my rink was merely a floating block of ice on top of a layer of water. The weight of the snow had pushed the slab down within my rink frame, displacing the water underneath and forcing it to seep up around the sides. This mixture of water and snow created a miserably-heavy 2″ layer of slush, the existence of which wasn’t known until I planted a dozen size-12 footprints in it across the length of the ice surface. You can guess what my dad and I did for the next two hours. Our backs won’t soon forget. 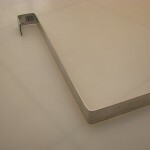 Without clear boards, it’s difficult to see how thick your slab is. And when you don’t know if your rink is frozen all the way to the ground, it can affect your approach when you’re trying to decide between removing snow during a storm or waiting until the last flake has fallen. It also helps with the “Can we skate dad? Can we, can we?” questions. Thus, the reason for this post. 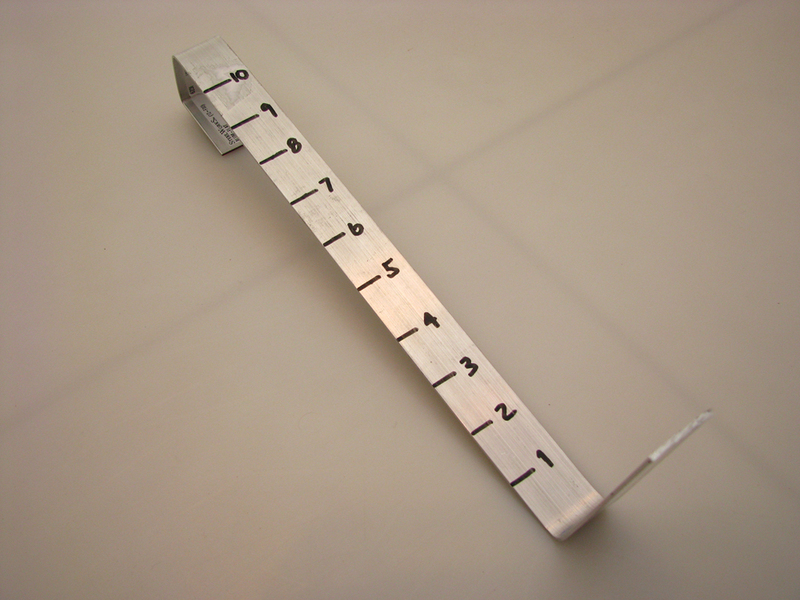 Lucky for us (and thanks to Rob), the creation of an ice thickness ruler is really simple. The only things you really need are a thin piece of metal, the ability to cut and bend it, and a Sharpie. The general idea is in the image to the right, using my 2″ x 12″ boards as an example. Your first step is to figure out how big your rulers need to be. This is primarily a function of your board height, but you may also want to take into account the depth of your water and the type of boards you’ll be using. 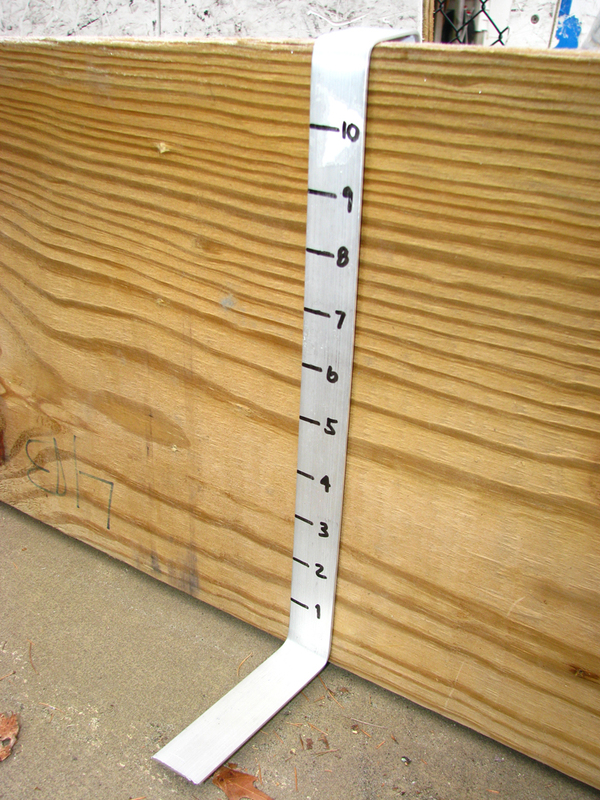 The most important dimension of the ruler is the long middle part, which should closely match your board height. 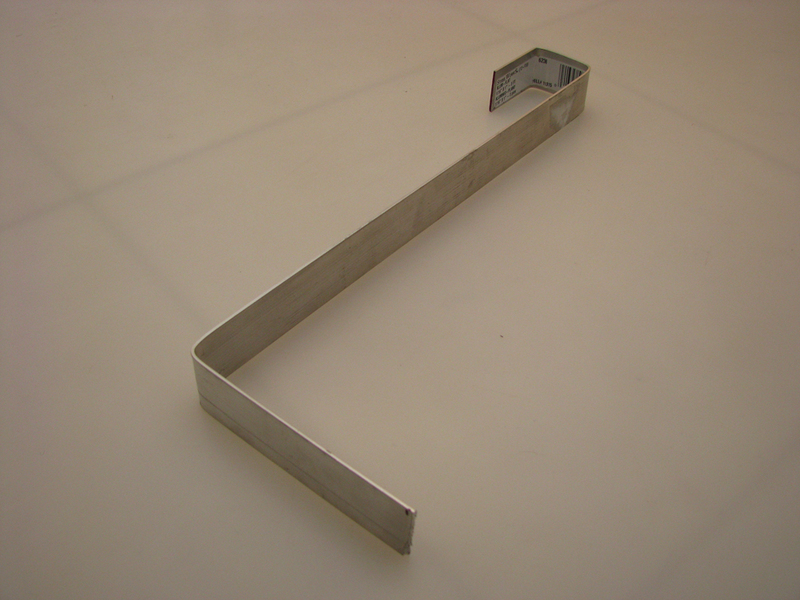 I found a bunch of metal strips in the hardware section of my local big box hardware store and purchased two pieces of 1/16″ x 1″ x 3′ aluminum, which is flexible and won’t rust. These particular pieces are made by SteelWorks, and they cost about $5 each. 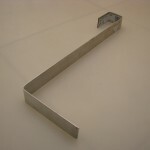 Cutting each piece in half will yield four rulers, one for each corner. And you’re done! When it comes time for fill day, lay your liner as you normally would, and then place your ice thickness rulers at each corner on top of your liner. Do this either before you fill or while your rink is filling, and the bottom of your ruler will be in place when the ice starts to form. The State of Minnesota says you’re safe to skate when you have four inches of solid ice. COMMENTS HAVE BEEN DISABLED FOR THIS POST AS OF DECEMBER 12, 2011. HAVE A QUESTION OR COMMENT? 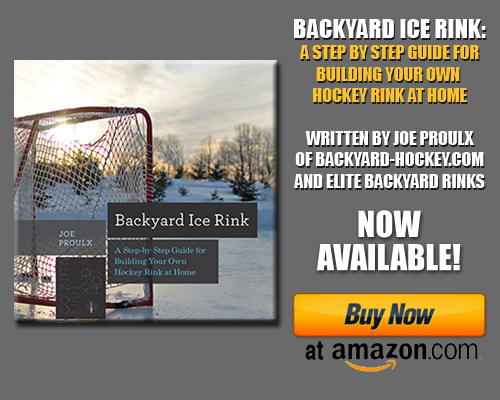 HEAD OVER TO THE BACKYARD-HOCKEY.COM FORUMS, REGISTER, AND POST YOUR COMMENTS THERE. THIS WAY OTHERS WHO HAVE SIMILAR QUESTIONS WILL EASILY BE ABLE TO FIND YOUR TOPIC, AND YOU’LL HAVE A BETTER CHANCE OF HAVING YOUR QUESTION ANSWERED. What do we do with the data?…What does the thickness need to be? e.g. 2″ = 100 lbs or less on ice, 3″ = safe for all…etc. Suggest making leg under ice wrapped completely in tape to prevent liner damage. Offset measurement. Hey Dave! Great question and suggestion. Conventional wisdom is no skating until there’s 4″ of ice, though I’m not sure I’ve followed that in recent years because I had no way of measuring. I know others on the Yahoo list check by drilling holes, so I’m sure there’s some information out there. The last two years my 30lb son has skated first while I shuffle around in boots, so there’s a chance the little ones could skate before the adults on less than 4″ of ice. I’ll be able to tell this year. And I’m updating the instructions with your tape suggestion. 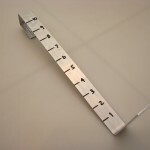 Don’t want anyone losing a liner because of a ruler puncture. Good call! This is a great idea, too bad I didn’t see this a couple weeks ago. On my rink, my best guess is that we have about 3 inches of ice. I skated on it tonight but it didn’t seem totally solid, and I definitely heard it creak once or twice. 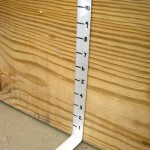 The highest depth in the rink is 6″, the lowest is about 4″. I live in Buffalo, NY, and our weather has been relatively warm, hovering around 27 degrees. Do you think that giving it another day or two to freeze will make for sufficient skating? I don’t want anyone falling through. Hi Joe. If you skated on it, I’d say it’s ready to go, despite the creaking. I have no idea how large you are in comparison to the other folks that’ll be skating, but I know that if my ice will hold me, it’ll hold my 40lb son. That said, it never hurts to get another couple cold nights under your belt if you’re not 100% confident. 27 degrees may be warm in Buffalo, but it’s below freezing, so you shouldn’t experience any melting. Good luck! I don’t understand how the ruler works. If you get a reading of six inches how do you know if you have 5 inches of ice and 1 inch of water vs. 1 inch of ice and 5 inches of water? Duce – you have to pull up on the ruler. If you pull up on it and it moves up five inches, you have one inch of ice. If you pull up on it and it only moves one inch, you have five inches of ice. We live in Columbus GA and only get a couple of freezing days in a year. Is there anyway I can make a simple rink outdoor that would allow by kids to skate atleast once before it melts? I have a seven year old who has been playing hockey for a long time but only in indoor rinks. He would love to skate ice once outside. Why not just mark the inches on the inside part of the board with a Sharpie? 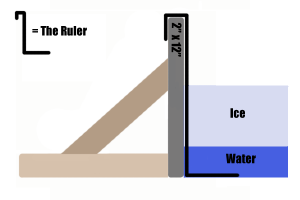 Rinkman – so if the top of the ice is at the 6″ mark using your method, how do you know if you have 1″ of ice on top of 5″ of water, or 5″ of ice on top of 1″ of water? I’m contemplating the feasibility of building a rink that would require ice 13″ thick at the low point (assuming 3″ minimum at the high point). Do you think ice that thick is feasible? (I’m in Minnesota). My low points are about 16 inches. However I live in a climate where overnight temperatures can be -20C for many consecutive days (more than 7). If Minnesota is the same, then it’s not a problem. I will have an initial flood of about ten inches, let it freeze solid, then have a few more nights of 1 or 2 inche floods depending on temperature.